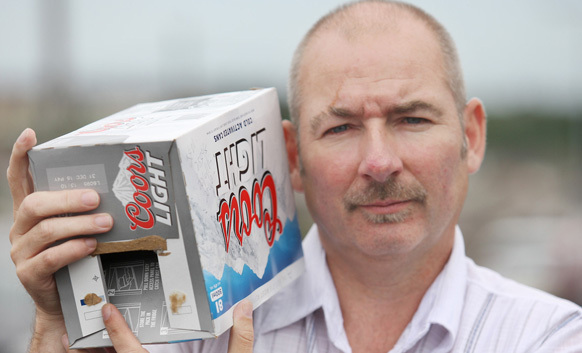 THE PSNI have been accused of unprofessionalism after an officer issued proof of a stop and search on a box of beer. Political activist Fra Hughes was stopped by police near Ladbrook Drive as he made his way back from a parades meeting in the nearby Houben Centre. Fra asked for official proof of the incident, as he’s entitled to do. When the policeman experienced difficulties with his Blackberry, he wrote the details on a box of beer that Fra was carrying. Fra, who has contested a number of elections, says he was left astounded by the June 20 incident. The Greater Ardoyne Residents Collective (GARC) in a freedom of information request obtained figures that showed 4,597 searches were carried out in the Ardoyne and Oldpark areas over a six-year period between January 2009 and January 2015. Fra says he believes what happened to him is an example of this harassment. The PSNI said any complaints should be forwarded to the Police Ombudsman.